Arabic name of a Jewish sect, meaning "Men of the Caves." According to the account given by Joseph al-Ḳirḳisani this sect was founded in the first century before the common era and derived its designation from the fact that it kept its books in caves. Except the writings of one named "the Alexandrinian," and a later work entitled "Sefer Yadua'," these books, he says, were of little value. The sect reckoned the months from the appearance of the new moon and prohibited games of every kind. It possessed strange commentaries on the Bible, and, contrary to the Sadducees, it was opposed to all anthropomorphisms. Believing God to be too sublime to mingle with matter, the sect rejected the idea that the world was created directly by Him, and invented an intermediary power. This power was an angel who produced the world, in which he is God's representative. The Law and all communications to prophets proceeded from this angel, to whom are referable all the anthropomorphic expressions concerning God found in the Bible. 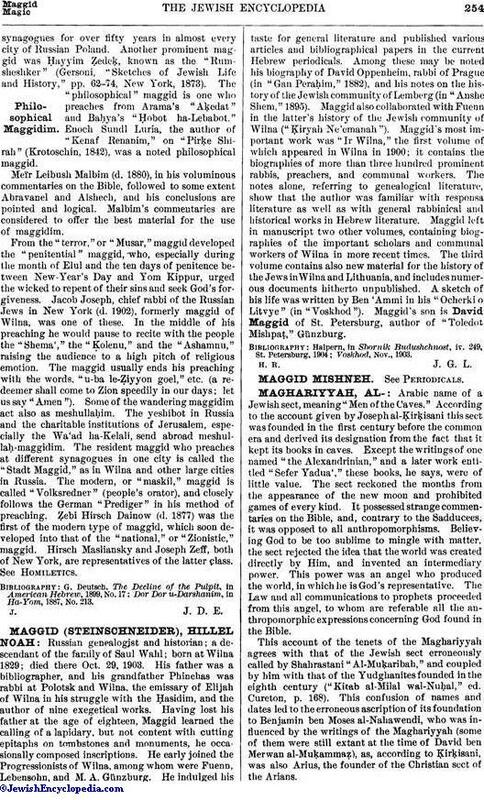 This account of the tenets of the Maghariyyah agrees with that of the Jewish sect erroneously called by Shahrastani "Al-Muḳaribah," and coupled by him with that of the Yudghanites founded in the eighth century ("Kitab al-Milal wal-Nuḥal," ed. Cureton, p. 168). This confusion of names and dates led to the erroneous ascription of its foundation to Benjamin ben Moses al-Nahawendi, who was influenced by the writings of the Maghariyyah (some of them were still extant at the time of David ben Merwan al-Muḳammaẓ), as, according to Ḳirḳisani, was also Arius, the founder of the Christian sect of the Arians. 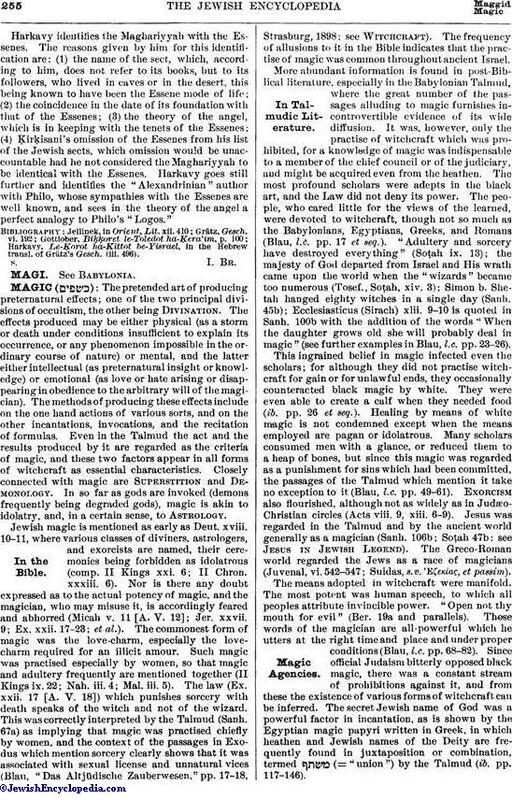 Harkavy identifies the Maghariyyah with the Essenes. The reasons given by him for this identification are: (1) the name of the sect, which, according to him, does not refer to its books, but to its followers, who lived in caves or in the desert, this being known to have been the Essene mode of life; (2) the coincidence in the date of its foundation with that of the Essenes; (3) the theory of the angel, which is in keeping with the tenets of the Essenes; (4) Ḳirḳisani's omission of the Essenes from his list of the Jewish sects, which omission would be unaccountable had he not considered the Maghariyyah to be identical with the Essenes. Harkavy goes still further and identifies the "Alexandrinian" author with Philo, whose sympathies with the Essenes are well known, and sees in the theory of the angel a perfect analogy to Philo's "Logos." Harkavy, Le-Ḳorot ha-Kittot be-Yisrael, in the Hebrew transl. of Grätz's Gesch. (iii. 496).